If visitors and residents in Morgantown were not familiar with Attorney Frank Walker before today, the unfamiliarity will soon fade. 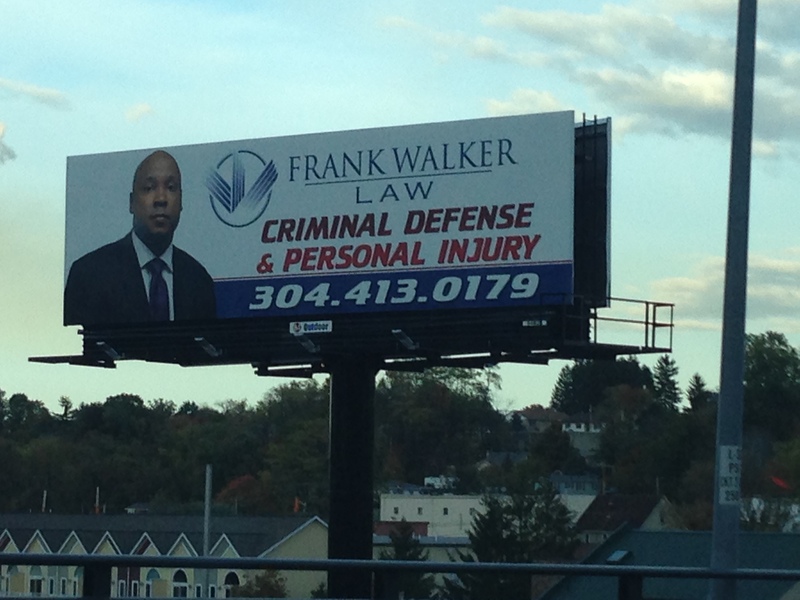 Morgantown Criminal Defense and Injury Attorney, Frank Walker of Frank Walker Law, has recently brokered an agreement to advertise on the large billboard in Morgantown, West Virginia right off the Star City exit. The Billboard advertisement is also visible to visiting teams and universities that fly into Pittsburgh Airport and drive into Morgantown to battle the WVU Mountaineers. If you or someone you love are facing criminal charges or seriously injured in an accident in WV or PA, contact Attorney Frank Walker immediately at 304.413.0179, 24 hours a day, 7 days a week for aggressive and experienced Criminal Defense or Representation in a Civil Case.